Christine Voncile Mann Darden has been responsible for advocacy, planning, and management of the aeronautical work at NASA's Langley Research Center done under the auspices of externally-led programs. She served as director of NASA’s Aero-Performing Center Program Management Office (APCPMO), worked with the Strategic Planning Office, and directed strategic communications and education before her retirement in 2007. During her career, Dr. Darden conducted extensive research for NASA in supersonic aircraft noise, especially in the area of sonic boom reduction. Dr. Darden has also been active with various boards and committees of the National Technical Association, American Institute of Aeronautics and Astronautics, Alpha Kappa Alpha Sorority, and the Presbyterian Church (U.S.A.), where she has also served as an ordained elder. 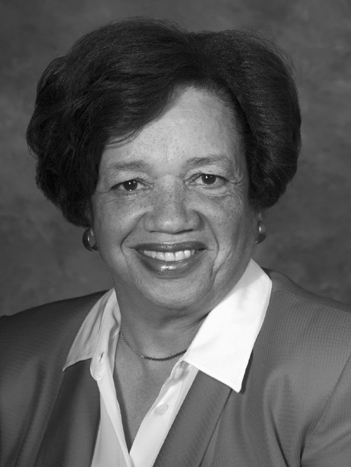 Her many awards include the Lifetime Achievement Award from Women in Aerospace and the Black Engineer of the Year Award for Outstanding Achievement in Government by the Council of Engineering Deans of Historically Black Colleges and Universities. She holds a B.S. degree from Hampton Institute, an M.S. in applied mathematics from Virginia State College, a D.Sc. degree in mechanical engineering from The George Washington University, and a certificate of advanced study in management from Simmons College Graduate School of Management.